324AL----Lovely Vacation Villa For Your Family! Stay at this cozy and peaceful home! 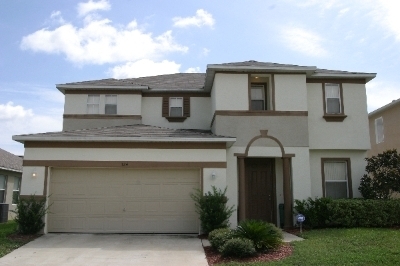 This seven room, four bedroom, two full and one half bathroom vacation villa is minutes away from Disney World and all of Orlando's other attractions! The master bedroom has a king size bed and an en suite bathroom with a stall shower and soaking tub. The kitchen is well equipped for all your cooking needs! The dining area seats six. There is a family room with a ceiling mounted flat screen TV, DVD player, laptop computer, printer and XBox video game console with a selection of games. The family room also has a convertible couch that sleeps two. Wind down in the game room with air hockey table, pool table and stereo! Cool off in the home's pool with screened enclosure. The home has a security alarm system and a safe for your personal valuables. You're going to love your vacation here!